This year, His Eminence Hilarion, Metropolitan of Eastern America & New York, First Hierarch of the Russian Church Abroad, will lead a pilgrimage to the holy sites of Russia. Further information and itinerary are available in PDF format below in Russian and English. Beloved in the Lord Archpastors, reverend Pastors and Deacons, Brothers and Sisters! We are happy to inform you that, with the blessings of our First Hierarch, His Eminence Metropolitan Hilarion and our Patron, His Eminence Archbishop Gabriel, of Montreal and Canada, we are presenting to you the schedule for the Eleventh Pilgrimage to the Holy Places of Russia. 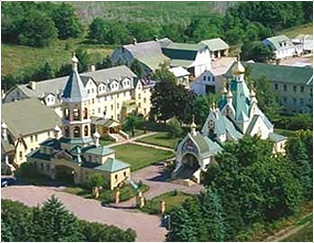 The program includes a visit to the Kursk Root Hermitage of the Nativity of the Mother of God, the St Seraphim-Diveyevo Convent (which is the “Fourth Lot” of the All-holy Theotokos), Murom, Suzdal, the Northern Caucasus of Russia, North Ossetia, and ancient Georgia with its sacred sites and its many holy historical landmarks. We invite you, our “seasoned” pilgrims and those who have not yet traveled with us, join us on a journey that will positively change and spiritually enrich you for the rest of your life. Brothers and sisters, our pilgrimage will begin in the city of Tbilisi. The holy relics and memorable places of Orthodox Georgia, its traditions and culture, have helped the people of the country to maintain their profound faith and national identity. At the beginning of the 19th century, Russia extended a helping hand by building the Georgian military road through the Darial Pass and the high cliffs and peaks of the Caucasus. In the 21st century, the Arkhyz face of Christ the Savior appeared in ancient Ossetia (Alania), becoming one of the testimonies of the Christian faith in this region. The Orthodox holy places of the Northern Caucasus, where the monastic tradition has been preserved for centuries, are closely connected to the ascetics of Orthodox piety in Kursk, Diveyevo, Moscow and all of Russia.